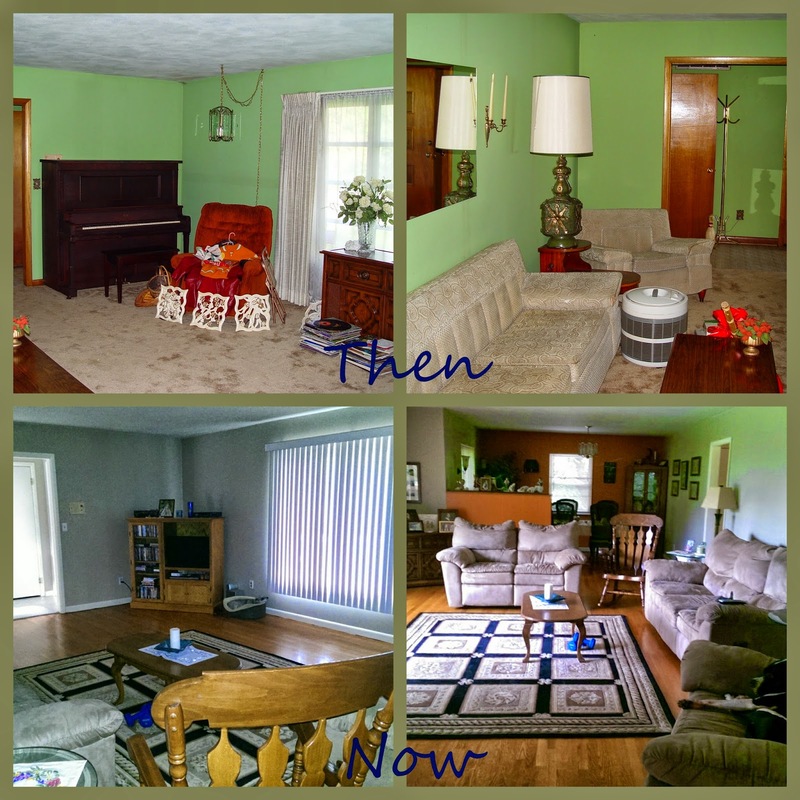 The Story of Our House: It's OURS! We also installed a new floor in the kitchen (to replace the lovely imitation red brick linoleum) and continued that into the front hallway (going over the 60's small tile..which was also in the bathrooms). We discussed tile, but I was nervous about it not withstanding 3 boys. Plus, we had a neighbor in SC who is in the floor business, and at one time he told us that to maintain the tile correctly, you have to clean it with certain products or else you'll ruin it. So, we went with snap-in linoleum that looks like tile. We had to have some plumbing stuff updated, and we had to have some electrical things updated. And, of course, the heating & air wasn't far behind. Paint: I feel like I painted for an eternity! Especially the master bedroom, kitchen area, and hall bathroom. Those were the rooms where the previous owner spent most of her time...and she was a smoker. That wouldn't have been bad, except she was a smoker who hadn't cleaned the walls & ceilings in forever. 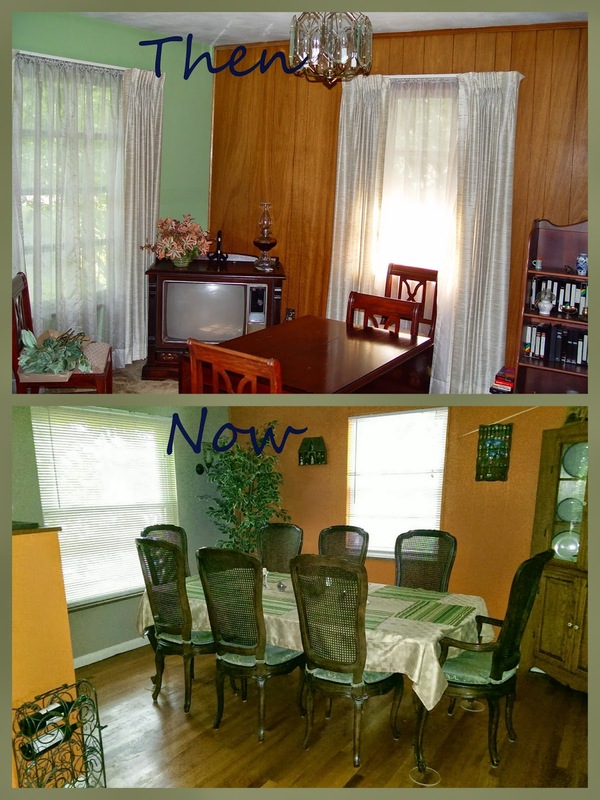 We "Kilzed" the ceilings and walls in those rooms multiple times before giving them several coats of paint. I even took the registers off and painted them. About a year after we were in the house, I took the doors down, sanded them, kilzed and painted them. And then I understood why the house still smelled like cigarette smoke: it was even in the doors. I gave the kitchen cabinets a good cleaning, and even cleaned the bricks on the fireplace. I was determined to get that smell out of here! Even now, there are times when there's a faint smell of smoke, but those are coming on fewer and fewer. The actual wall color now can be seen in the bottom left picture. These were the easiest rooms since they were blocked off by shut doors. I don't think they were used very often. All we did in these rooms (besides the floor) was paint. We discussed taking the divider down, but we're not sure if the hardwood floor was continued under it, or what. I'd like to maybe cut part of it down so it isn't so high and find a decent top for it. For the sake of the length of this post, I'll continue the "Then & Now" pictures next time! Wow! What a difference! Just beautiful work. I'm enjoying this story line a lot! I think buying a house of a former smoker would be rough. I'm sure I would smell the smoke no matter how much kilz was used. Nice! Your floors look beautiful!! We bought a house once that smokers had lived in. Everything was yellow. We took down the mini blinds and let them soak several days in the tub with cleaner (came out like brand new). 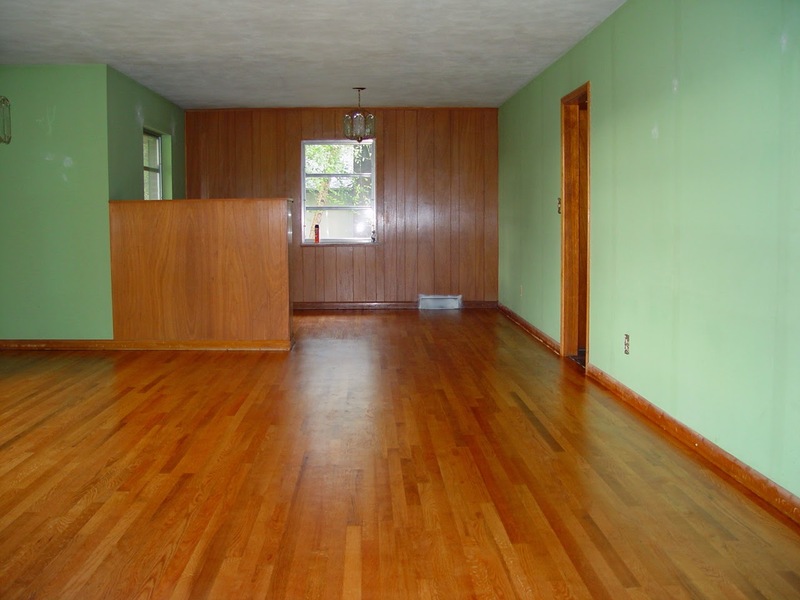 We also painted every wall and ceiling and put in all new floors. All that seemed to do the trick. What a difference you've made. I can't imagine the cigarette smoke smell-that would possibly kill me. I grew up with that and have no tolerance for it now. We really need hardwood floors because of allergies.